Neutral Grip Chin Up is an effective exercise for targeting the entire back particularly the lower lat muscles. 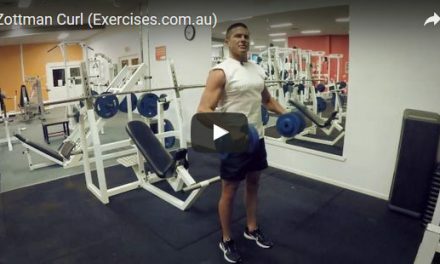 This exercise also works the rear shoulders, biceps and forearm muscles. A neutral grip has your palms facing each other which places your elbows in a bio-mechanically stronger and safer position compared to a wide overhand grip or a close underhand grip. 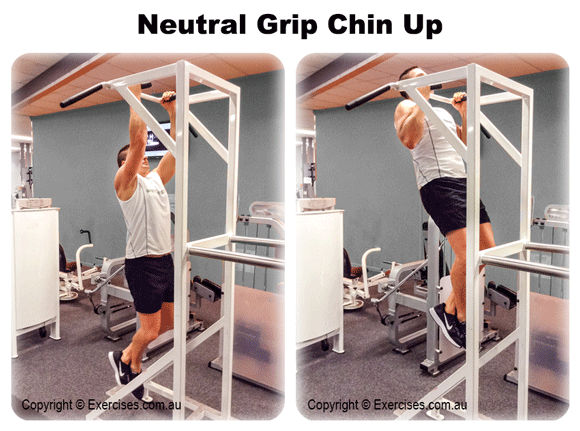 Neutral Grip Chin Up activates the lower lats which are made up of thick, fast twitch fibres. This is an exercise where you get better results using low reps done explosively or with heavy weight. On a pull up station, take a neutral grip on its parallel bars. Your palms should be facing each other. Retract your scapulae, tighten your core, lightly arch your lower back and push your chest out. Keep a slight bend in your elbows. Take a deep breath, exhale then contract your lats. Pull yourself up until your upper chest is at the parallel bar. Hook one foot behind the other for stability. Hold the position for a count of “one”. Lower your body under control. Resist your bodyweight as you go back to starting position. Keep a slight bend in your arms and pull yourself straight up without moving your elbows. Another version is to pull yourself up to your sternum. This type of Neutral Grip Chin Up hits a larger area of the lower lats.